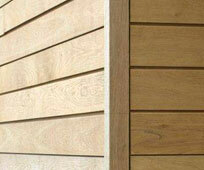 European Larch is a moderately durable softwood that is fairly easy to work with. 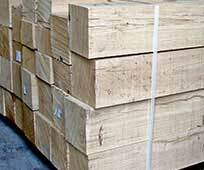 It is often used for structural projects and is offered here as European Larch beams. The natural habitat of larch is the mountainous areas ascending to great elevations, generally from the Bavarian to Swiss Alps, through western Poland and the Moravian Heights to the Carpathians. It has also been extensively planted elsewhere in Europe including the UK where it was introduced early in the seventeenth century. Larch attains a height of 30m to 45m and a diameter of 1m or slightly more, and in favourable situations with a long, clean, cylindrical bole for two-thirds of its length. Essentially a natural tree of the mountains, it requires long, really cold winters for its best development ; it is deciduous, and appears to depend upon a long winter rest for the ripening of its wood. In the UK the winters are either short or mild, and neither provide ideal growth conditions. For this reason, English larch is generally inferior to that grown naturally in the mountains. The heartwood is pale reddish-brown to brick-red in colour, sharply defined from the marrow, lighter-coloured sapwood. It is very resinous wood, with clearly marked annual rings, a straight grain, and a fine, uniform texture. It is rather heavy weighing 590 kg/m3 when dried. Dries fairly rapidly with an inclination to distort and for knots to split and loosen. 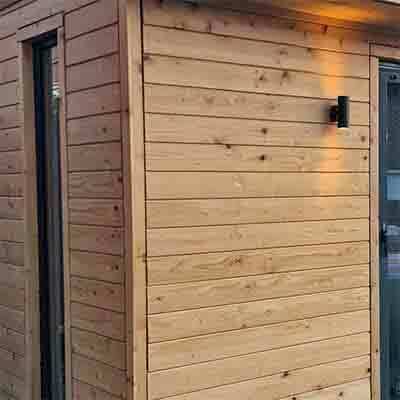 A hard tough timber, it is about 50 per cent harder that Scots pine and slightly stronger in bending and toughness ; in other strength categories it is about the same as for Scots pine. Saw, machines and finishes fairly well, but loosened knots may be troublesome. The wood takes the usual finishing media quite well, but it tends to split in nailing.